Did Fortnite Copy the ‘Hare Hare Yukai’ Dance? 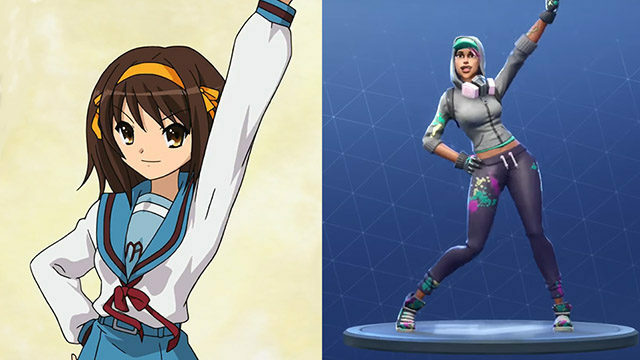 Keen-eyed gamers have taken notice recently that a dance emote added to the hit online multiplayer game Fortnite Battle Royale bears a striking resemblance to the ending theme dance from The Melancholy of Haruhi Suzumiya. The ending theme song “Hare Hare Yukai” was first heard back in 2006 during the original run of the anime and was accompanied by a dance performed by the show’s characters. The song was a huge hit among anime fans during the time of Haruhi’s peak in popularity. The dance has seen little recent attention until online users began claiming that they noticed a dance emote in Fortnite that seemed to be imitating the over decade old anime theme. As users scrubbed through old YouTube videos from 2007, it was confirmed that the Fortnite dance seemed to copy some of the “Hare Hare Yukai” moves almost exactly. Strangely, the dance was found to have been added to the game several weeks ago before anyone took notice. Many claim this to be due to the age demographics of Fortnite, where a majority of players wouldn’t have been able to recognize the source of the dance. We attempted to ask Herman for more information, but he abruptly excused himself claiming that he had some old camera memory cards that he needed to erase.